occupational theory – Real Science at SOEST! HAS MOVED! I had invested in a master’s degree and four years of work experience, but I could not imagine another 40+ years of constantly being around people in pain. As I, the occupational therapist (a.k.a. the pain bearer), gazed upon the agony in the patients’ faces during therapy, I realized that my career no longer reflected ‘me.’ Furthermore, I would often see readmissions and feel discouraged because we had just completed weeks of exercises, daily living and safety training. Although I have seen some successes, the failures took too large of a toll on me. The good income and job stability were not enough to lessen my heavy heart. After reflecting on what I enjoyed most since grade school and did best in academically, I concluded that I should return to school to study mathematics. I wasn’t sure how I would survive Calculus III without having done any math for nine years, or where a degree in math would lead me, but I needed a change. As a second Bachelor’s student majoring in mathematics at the University of Hawai‘i (UH) at Mānoa, I took Oceanography 201: Science of the Sea to fulfill degree requirements. I have always felt a deep connection to the ocean being born and raised in ʻĀina Haina, so my mind was blown away with how much mathematics was in oceanography! I had no idea that waves could be explained with differential equations, and I never thought about the spreadsheets of data that are available to study the ocean. At the moment I learned about the math-oceanography connection, I knew that I wanted to be an oceanographer. 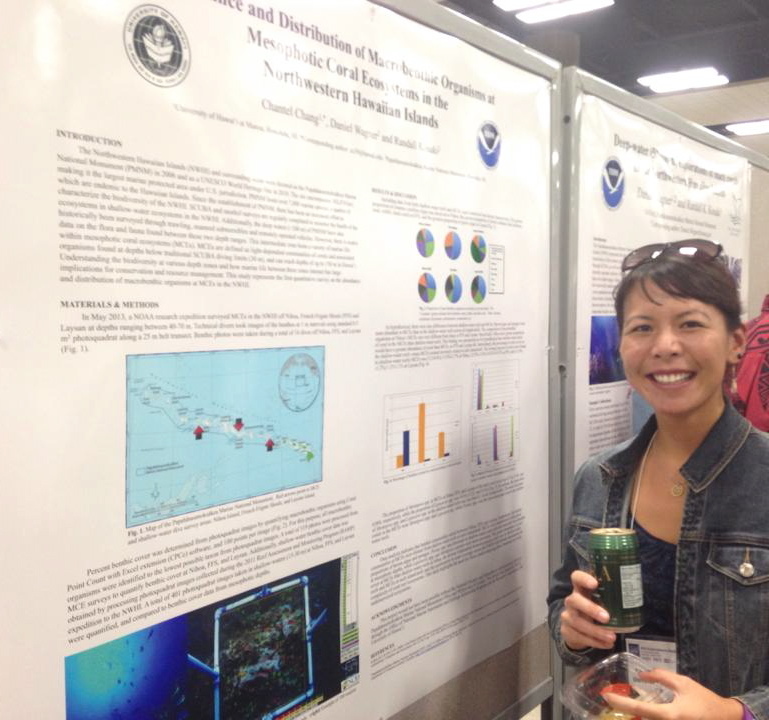 Chantel standing in front of her poster at the ASLO/AGU/TOS Ocean Sciences Meeting held in Honolulu, HI in February 2014. After completing my B.S. in Mathematics and a certificate in the Marine Option Program in December 2013, I was accepted into the Biological Oceanography Division with a graduate research assistantship. Finding myself in another transition, I was nervous about not being able to keep up with the biological and oceanographic jargon and concepts. However, having one successful transition from occupational therapy to math, I felt that if I worked hard enough and remained passionate, I could survive. However, along with my stubborn determination to succeed in my new field and my perfectionism, I found that time previously used to visit ʻohana (family) and friends, exercise, and surf was all invested into studying night and day, while drinking unhealthy quantities of coffee. It took me hours to read one journal article, and then I’d need to read it again… and again… and again to comprehend it. I felt that I was more than a couple of steps behind my classmates (most of whom knew that they wanted to be marine scientists pretty much since the day they were born) – in my mind, I was miles behind. The most common thing I’d hear from ʻohana and friends was, ‘long time no see,’ and fellow graduate students asked why I didn’t attend social events like ‘Coffee hour’ or Nerd Nite. I realized (after several months of study and no play) that my life balance was off. Near the end of the semester, I was approached by Anela Choy, a recent PhD graduate and co-founder and program manager of the Maile Mentoring Bridge Program (ʻMaileʻ for short). 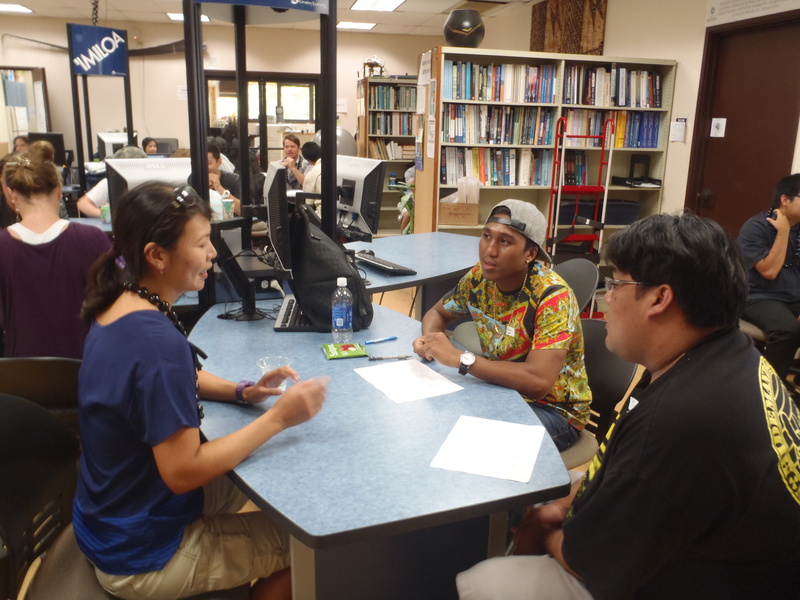 Maile is a program that supports Native Hawaiian and other underrepresented minority undergraduate students interested in ocean and earth sciences by pairing them with graduate student mentors within SOEST. Anela indicated that she was leaving Hawaiʻi at the end of the year and that she needed another local person from Hawaiʻi in the SOEST graduate program to take over her program management duties… and that I was one of about five current SOEST graduate students who were from Hawaiʻi. I knew there weren’t many of us locals in SOEST, but I was shocked with the lack of kamaʻāina (from Hawai‘i) graduate students in SOEST. It’s baffling that there aren’t more kamaʻāina in SOEST, when we have grown up with a beautiful ocean surrounding us and active volcanoes nearby. Perhaps many kamaʻāina are like me; we love Hawaiʻi’s natural beauty, but just havenʻt thought about studying it for a career. I wasn’t sure if I should take Anela’s offer to be an alakaʻi (leader) for Maile because of my life balance struggles from the last semester, but I took it anyway because I thought of the possibility of helping more kamaʻāina realize that great science is being done in their backyards! I found Maile has been a blessing in helping me to improve my time management skills and feel at home in SOEST. My position as program manager forced me to actually take lunch and study breaks, in order to attend SOEST events where I could meet colleagues. Although every single person has been very welcoming and I enjoy meeting people from different places, it was interesting to feel almost an instant connection and comfort in meeting other kamaʻāina within SOEST. They understand the local culture, mentality, pidgin language, and the challenge of being in a rigorous graduate program while being home which involves juggling large extended ʻohanas, friends from ʻda hanabata (childhood) days, and new friends. They recognize the importance of ʻohana, but also the importance of being a part of SOEST because of the need for diversity in creating a more comprehensive and accurate scientific perspective. Being a part of Maile and meeting well-balanced and successful kamaʻāina in the ocean and earth sciences gives me fervent hope that I, too, will be a role model for future kamaʻāina in SOEST, find my balance in graduate school, and a career that is more ‘me’. 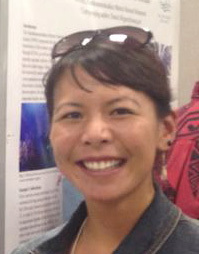 Chantel Chang is a graduate student pursuing a M.S. in Biological Oceanography, working with Dr. Anna Neuheimer on a project involving biophysical modeling of holoplankton. She is also an alakaʻi for the SOEST Maile Mentoring Bridge. In her re-found free time, she enjoys spending time with her ʻohana, surfing, reading, and eating House of Pure Aloha shave ice. Check out Chantel’s professional website!